A field weather is an object, specifying location of local cloud coverage areas within cloud layers. 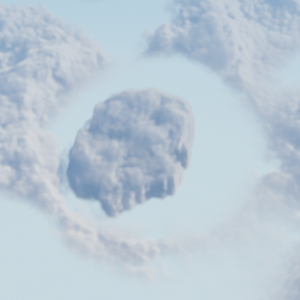 FieldWeather object makes it possible to create local storms or clouds having their own coverage texture as well as to control their movement. The number of FieldWeather objects on the scene is not limited as their impact on performance is not significant. A FieldWeather coverage is visible only when the camera is within the dynamic coverage area, which can be set up via the Settings window. 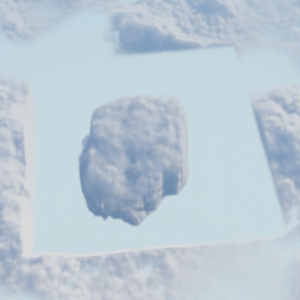 A FieldWeather object will affect clouds only if the Field mask matches a Field weather mask of the clouds_base material. 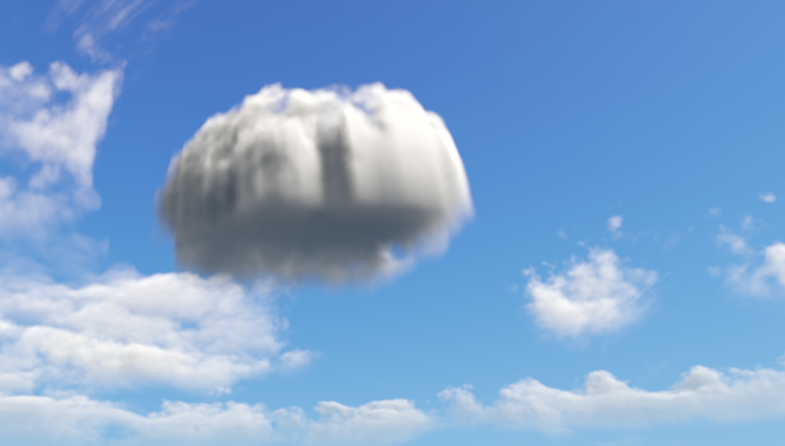 Local stormcloud created by using a FieldWeather object. A FieldWeather class to create a FieldWeather object by using C++, C# or UnigineScript API. 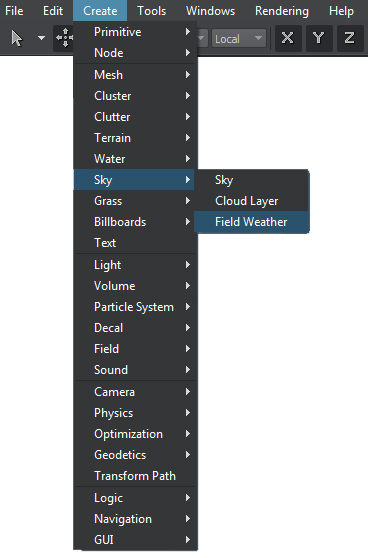 On the Menu bar, choose Create -> Sky -> Field Weather. Place the weather field in the world. It doesn't matter if it intersects a CloudLayer object or not, only X and Y coordinates are used. Go to the Field Weather tab of the Parameters window, and set up necessary parameters. A field mask. The weather field will be applied to a cloud layer only if they have matching masks. A viewport mask. 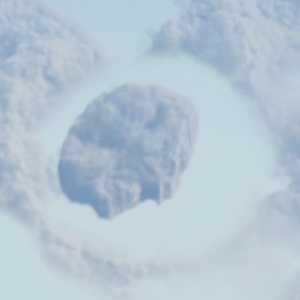 A bit mask for rendering the weather field into the current viewport. For the weather field to be rendered into the viewport, its mask should match the camera viewport mask. Size of the weather field along the axes in units. Attenuation factor indicating how much the coverage texture attenuates starting from the center of the weather field to its edges. By the minimum value of 0, only local coverage texture of the FieldWeather will be visible (the coverage texture of the CloudLayer is totally cut out from the FieldWeather area). The higher the value, the less surrounding clouds (CloudLayer coverage) are cut out from the weather field area. Determines the contrast of the coverage texture. Makes it possible to gradually increase cloudiness without changing the coverage texture. This parameter is analogous to coverage contrast parameter of the clouds_base material. For this parameter to work properly, the coverage texture must not contain absolutely black pixels. Determines the degree of impact of the coverage texture of the weather field on the clouds. An RGB8 coverage texture for a weather field. 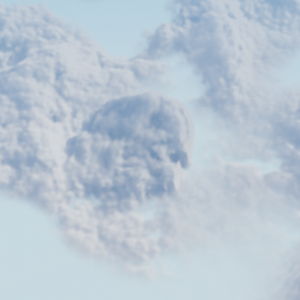 This texture is analogous to the coverage texture of the clouds_base material. Indicates whether the local wind inside the weather field is enabled. Wind speed in each direction inside the weather field. The wind along X and Y axes shifts local coverage texture at the specified rates in the corresponding directions. 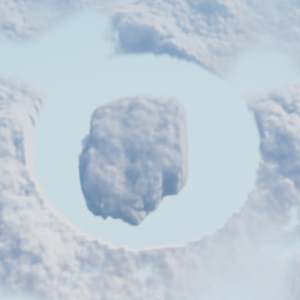 This parameter can be used to animate clouds inside the weather field. The texture shifting is looped inside the field, as the wind affects only its offset. 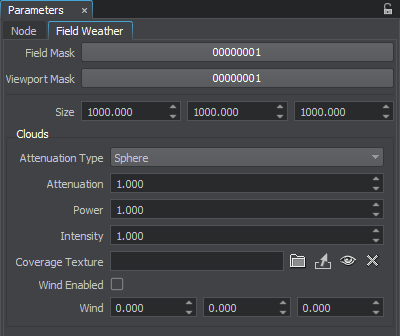 Setting wind speed values to zero does not return the texture to its initial state. In order to return the initial state disable local wind by unchecking the Wind enabled option.